Kids! It's me, Hulk Hogan, and I'm gonna take my 24" pythons, and I'm going to crush this child! No one plays hockey like me and my friends! We invented 'full contact' in the WWF! Friends, you know you want to play hockey with all your favorite WWF all stars! At least the ones who needed the money bad enough to sign the endorsement contract! Go bug mom and dad until they buy this for you! Play it once, then shove it into the back of your closet where your mom will find it after you go to college and she'll throw it out! And then you'll find out it was worth a cool million bucks* on eBay! That's cause for justifiable homicide, arrrrrggghhh! But I really am not in the mood to type tonight. I want to play video games. So I'm just going to move right along with todays oddity post. Well, in a minute, I guess. 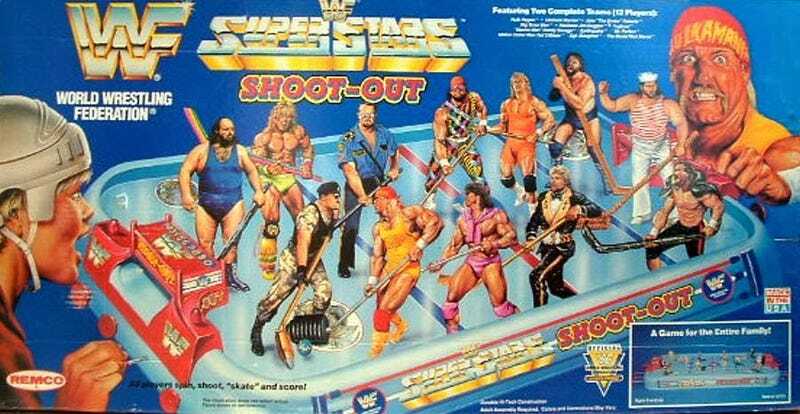 I just want to point out that if you look at the box-art for the WWF Superstars Shoot-Out Hockey Game features Hulk Hogan playing table top hockey with a child wearing a helmet. Was he dropped off by the short bus, too? What's the matter Hulk, afraid to face off against a 'normal' child? I mean, look at their faces; Hulk looks like he's saying "Grrrr...I'm going to crush you into the ice! ", and the child looks like he's saying "I wet my arm pants!" Today is, of course, Tell The Truth Tuesday. And it's time for me to reveal the truth behind the fact I told you yesterday. And that truth is......I lied. The Roman roads that are still in existence are the most well preserved and plentiful, but they are not the oldest. In fact, the oldest Roman roads are closer to modern times than they were to the first paved roads. Before I tell you about the first paved road, I should probably tell you about the first civilization to use wheeled transportation. Because, oddly enough, it's believed that they aren't the same. About 5,300 years ago, a civilization cropped up in the Indus Valley. They have been named, with a lot of imagination, the Indus Valley Civilization. Really. That's how creative anthropologists can be. The IVC was a bronze age civilization that stretched from Afghanistan to India and was one of the three old world civilizations. (The others being Egypt and Mesopotamia). The IVC was a trade based civilization, and extensive man made canals have been found. The first evidence of using the wheel for transportation have been found in the ruins of the IVC. Sadly, very little is known about he IVC as none of their writings have been found. We don't even know what their language was. But we do know they had well planned out cities. And those cities had running water and sophisticated sear systems. And they had advanced methods of grain storage that helped keep out moisture and vermin. But I'm supposed to be talking about roads. The oldest known paved road is more than 4,600 years old. And it was found in Egypt. It stretches for about 7 1/2 miles, and it a very solid road made out of limestone and sand stone slabs. At the point in time when it was built, the Egyptians only used the wheel for pottery. (that's why the wheel was invented). So why did the Egyptians build a paved road if they didn't have wheeled vehicles? It was because of their building projects. If you look at the ancient Egyptian buildings, one thing is clear; they used large stones to do their building. And they used wooden sleds to pull the loads of building blocks from the quarries to the work sites. (when they couldn't use the river, that is). And if you've ever pulled a sled with a few tons of rock on it, you'll know a solid surface makes it easier than sand or dirt. So they paved roads. Some people have asked that since the Egyptians build roads to help move building materials, why don't more of their roads survive? And there's a simple answer for that; The blocks they used for paving were also used in the construction of their buildings. Once all the really huge blocks were on the site, they started pulling up the roads and using those stones as well. So there you have it. I lied again. What do you want from me? It's winter and it's cold in Wisconsin. By lying I get a free pants fire, and that helps keep the heating costs down. Todays oddity involves hockey. What's odd about hockey? Well, nothing if you play ice hockey, or field hockey, or even air hockey. But I'm not talking about those types of hockey. Oh no. You see, I'm talking about the type of hockey that is governed by the CMAS. (Confederation Mondiale des Activites Subaquatiques). In English, that would be the World Underwater Federation. The same group that is in charge of things like certifying scuba divers. Because this is Underwater Hockey I'm talking about. And underwater hockey isn't some lame, made up sport that drunk college kids play either. It's an actual world wide sanctioned sport. It's played primarily like regular hockey, except its underwater. The puck is made of lead and the sticks are only about a foot and a half long. Oh, and since the players are only allowed to use a snorkel, they spend a lot of time rushing up to the surface to get more air. If you get a chance to watch an underwater hockey match, I suggest you do it. It's a surprisingly entertaining game. But then again, I also am a fan of 43 Man Squamish. * Ok, so maybe the actual definition of "a cool million bucks" differs from what's on eBay. But remember, this is Hulk Hogan we're talking about. And he can count to potato.